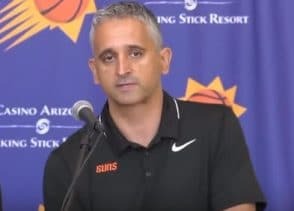 The Phoenix Suns Summer league team has bought into Igor Kokskov’s most significant strength which is to create a system that fits its personnel. The Phoenix Suns hired him because it was clear to them that some coaches only had a particular system. Igor Kokoskov is going to build a system about his players. The Phoenix Suns Summer League team showed remarkable growth in their short time with Igor. Kokoskov demonstrated his coaching ability when he leads Slovenia to the 2018 Eurobasket Championship for the first time. He can put a system together that has several options that will lead to better flow, spacing, and movement. Alvin Gentry of the New Orleans Pelican says that he runs a lot of continuity sets where if something doesn’t work then you go to this option. One of the new thing that new coach Igo Kokoskov is putting this Phoenix Suns Summer League is “basketball yoga”. It’s something cheesy, but it’s a drill that teaches his players two critical fundamentals which are balance and control. Suns General Manager Ryan McDonough thinks that his new head coach is a pioneer and creative basketball mind. One of the reasons that McDonough hired him was his skill development mind. Kokoskov worked out all the draft prospects and helped the Suns in picking Deandre Ayton with the top overall pick. The Phoenix Suns Summer League team practices have had a new attitude to them. Josh Jackson, Starting Forward, thinks that the energy in a Kokoskov-led practice has been fantastic. Ayton has gone on record as saying that he believes that his coach is brilliant and remarkably different. They all love the new ideas. I think that you will see the Phoenix Suns as an up and coming team in the NBA Western Conference in the next couple years. They will be a team that plays tough-nosed defense and isn’t something that they did last year as they were the NBA’s worst defensive team. I look forward to how they are going to make progress with their new coach.